What you have right now is a real-world example of an array! The piece of paper called "groceries" would be your array. The items that you need to purchase are known as the array values. 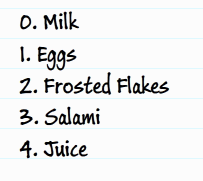 In this tutorial, you will learn all about what I like to go grocery shopping for. You may indirectly learn a whole lot more about arrays as well! You have your declaration on the left where you designate the variable as storing an array, and you have your array constructor on the right where you not only create a new array but also populate it with some initial values. 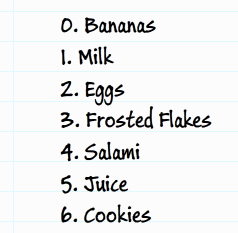 The end result is that you will have an array object called groceries with nothing inside it. You can use either the explicit "new Array" or array operator approach to instantiate your array object. The end result is the same. The difference is in how your code looks. In this tutorial, I will explicitly declare the array using the new keyword and not use the array operator. Since it is always satisfying to see what your code is doing - even if it is just plain text, let's next look at how you will display the contents of your array. All you need to do is pass in your array object into the trace() function. You should note that this also works because our array is just simple string values. When you start storing anything more complex, this may not work quite as well. The only thing you need to know is what the procedure is for accessing an individual item. Inside an arrays, each item is assigned a number starting with zero. 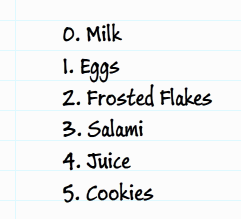 In the above example, Milk would be given the value 0, Eggs the value 1, Frosted Flakes the value 2, and so on. The formal term for these numbers is called the index value. The index value is passed in to you array object using the square brackets. In this example, you are referring to the Eggs value because the index position 1 refers to it. If you passed in a 2, you would return Frosted Flakes. You can keep passing in a index value until you have no more values left. The range of numbers you can use as your index values is one less than your array's length. The reason is that your index values start with a 0. 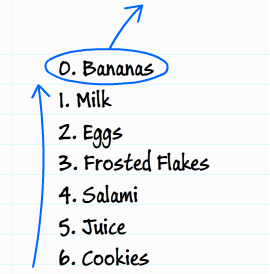 If your array only has 5 items, trying to display grocery or grocery will result in a message of 'undefined' - remember, an array's index starts at 0. An index value of 5 is actually referring to the 6th item in an array. Notice the the range of your loop starts at 0 and ends just one before your array's full length (as returned by the length property). This works because, like I mentioned earlier, your array index goes from 0 to one short of the value returned for the array's length! The push method is called on your array, and you pass in the data you want to add to it. The newly added data will always find itself at the end of the array. The reason is that the first item in your array will always have an index value of 0. This means that the space originally occupied by the 0th item needs to push itself and everything below it out to make room for the new data. Not sure why that is useful, but keep it under your hat in case you do need it. Note that, when you are adding items to your array using unshift or push, the returned value from that method call is the new length of your array. When you are removing items using shift and pop, the value returned by the method call is the removed item itself! To find items inside your array, you have two built-in methods called indexOf and lastIndexOf. These methods work by scanning your array and returning the index position of the matching element. The value returned by indexOf in this case will be 1. The lastIndexOf method is similar to indexOf in how you use it, but it differs a bit on what it returns when an element is found. Where indexOf finds the first occurrence of the element you are searching for, lastIndexOf finds the last occurence of the element you are searching for and returns that element's index position. When you search for an element that does not exist in your array, both indexOf and lastIndexOf return a value of -1. In this example, because the concat method returns a new array, I create a new Array object called goodAndBad to store the results of our concatenation operation. The order of the elements inside goodAndBad is good first and bad second. That is almost all there is to know about arrays...well, at least the things you will use them for most frequently. 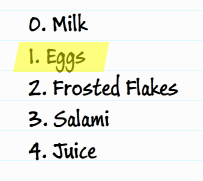 At the very least, you will have learned how to use them to create a grocery list!